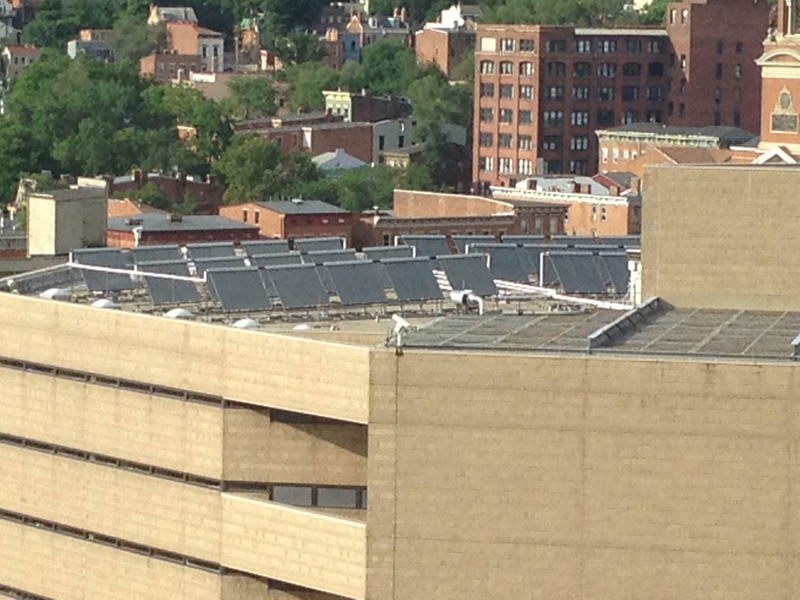 A new solar system was installed 8 months ago on the roof of the Justice Center. Even on a cloudy day the panels raised the water temperature 9 degrees. (from left) in the Justice Center room with the storage tanks are Assistant Facilities Director Tony Matre and Senior Building Manager Joe Merkt. 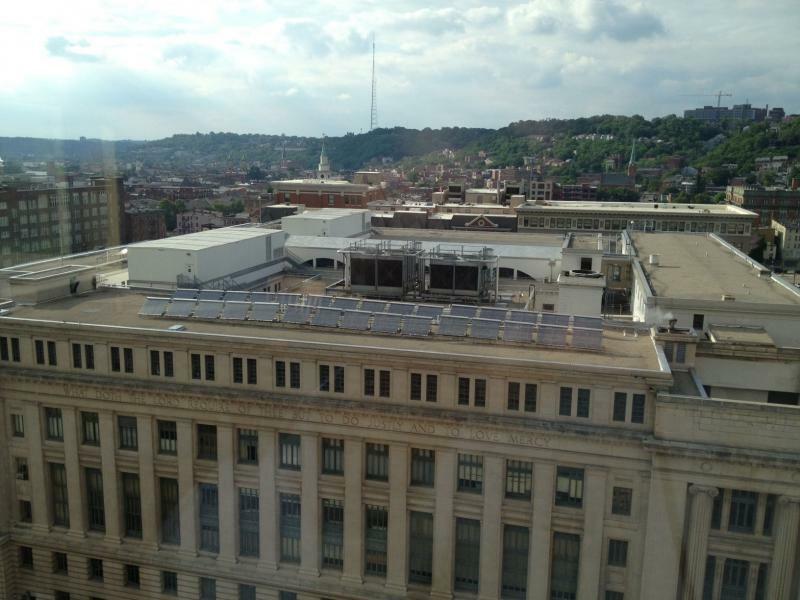 There are 50 solar panels on top of the Hamilton County Courthouse. The panels are part of a $20 million project. These panels are hot to the touch on a sunny day. The county can't store the sun's energy for uses other than heating water because of cost and lack of space. For the past eight months inmates at the jail have been taking showers with water heated by the panels. When solar heat is not available, heat pump water heaters and steam-to-water heat exchangers take over. Director of Facilities Ralph Linne says he is very pleased with the results. "What's interesting is the solar panels, particularly the ones on the justice center, (have) kept the temperature of the water at the temperature that we were guaranteed that it would. Also, you realize when there is snow out there you get better reflection, so yes, they are working fine." Even Thursday, a cloudy day, Senior Building Manager Joe Merkt estimated the panels heated the water nine degrees. With sun, that temperatures goes up to 140 degrees. The system serving the Courthouse consists of 50 roof mounted solar panels and 10 storage tanks located in the mechanical room. This system is used to provide hot water for the courthouse. When solar heat is not available, steam-to-water heat exchangers provide the heat. The county can't store the sun's energy for uses other than heating water according to assistant facilities director Tony Matre because of cost and lack of space. Facilities managers say the county is saving money because they are reducing electricity and natural gas for hot water. The approximate payback is 10 years. Plans for more solar on city building rooftops in Cincinnati are looking up this year. Director of the Office of Environment and Sustainability Larry Falkin says the city laid low in 2013 because the value of renewable energy credits was down and some state programs expired. "We think we're back in a situation where the economics work now and we have projects that we're working on and we hope to be able to announce them in the near future." Falkin says the announcement could come in the next two to three months. A new report sings the praises of solar in Cincinnati. The group Environment Ohio hopes Cincinnati follows the lead of such solar giants as Ann Arbor, Phoenix and Toledo. Co-author of the new report, called Building a Solar Cincinnati, Christian Adams, wants the city to get 10% of its energy from solar by 2030. He says certain barriers remain like up front cost but suggests third-party financing. A solar panel is typically made up of lots of silicon cells that together form a circuit. The electrons zip through the panels to create electricity in a very efficient manner. But what if scientists could create the same efficiency in a different material that was cheaper? Fei Yu, a University of Cincinnati doctoral student in materials engineering, is studying how to make polymer solar cells more efficient. Right now their performance is well below the most efficient silicon solar panels.